Sowerby Bridge and Shelf United look poised to mount title challenges after they notched key wins in the Haslem-Sheppard Halifax AFL on Saturday. 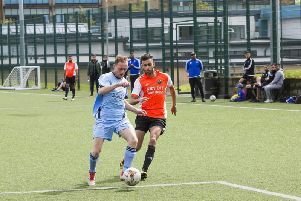 Bridge had a 3-2 success away to champions Shelf FC with a last-minute winner from John Wilkinson while Shelf United beat table-topping Midgley United 2-0 as the Premier Division’s leading four were all beaten. Bridge and Shelf FC cancelled each other out in the opening exchanges at Westwood Park but Bridge hit the front after 20 minutes when Sam Hiley’s clever turn and strike left the ball nestling in the top corner. Shelf FC equalised 10 minutes later. A scuffed shot was pounced on by Alex O’Keefe, who slotted home from close range. Bridge had an ideal chance to go back in front when Tom Hiley was brought down in the box but Martyn Bates saw his spot kicked saved by Pawel Szypulski. Shelf FC started the second half strongly and deservedly went in front when O’Keefe found Joshua Hans, who saw his deflected shot beat Jordan Bolton in the Bridge goal. On the hour mark both teams were reduced to 10 men and this seemed to inspire the visitors more than the hosts. Skipper Lee Wood won a free kick 35 yards from goal and Adam Barlow hit an absolute gem of a left foot strike straight into the top corner. At 2-2 the game could have gone either way. Wood saw a header cleared of the line and Callum Lewis had two glorious chances for the hosts but Bolton pulled off a brilliant save and then Joel Cleary’s exceptionally timed challenge saved a certain goal. In the last minute, Bridge won two corners in quick succession and from the second of them super sub John Wilkinson’s vicious left foot inswinging corner curled straight into the top corner sparking wild scenes from the Bridge contingent. Two first-half goals put Shelf United in the driving seat against Midgley. Some dangerous crosses from Matthew Roy came to nothing before Ben Grech’s through ball found David Chappell, whose first-time shot from the edge of the area went across the keeper and into the net. Grech made it 2-0 after some decent Shelf football, mopping up a rebound off the keeper. Grech was denied by a great save after the break and Midgley upped their game and sent big Joe Gibson up front. Ethan Daly made a couple of regulation saves and Midgley missed a late penalty when Andy Butterworth sent his effort over the bar. Defender Jonathan Farrell and midfielders Jonny Butterfield and James Waggett caught the eye for Shelf while Dan Vile played well for Midgley. Greetland and Hebden Royd Red Star, like Midgley, also suffered their fourth league defeats of the season and look to have dropped too many points to stay in the hunt for honours. Greetland were beaten 7-5 at Denholme United’s Foster Park ground. Michael Midgley and Nathan Woodhead scored twice each for the hosts to end Greetland’s four-match winning streak. Hebden Royd Red Star had some key men missing at home to Sowerby United and lost 2-1 with a stunning solo goal from Corey Henderson decisive. Receiving the ball just inside the Red Star half, the fleet footed Henderson went past four defenders before rounding the keeper and coolly finishing. Sowerby had taken an early first half lead when a great pass from Harvey Walsh picked out Tom Hosker, who struck the ball it into the corner of the net. Red Star responded well and at times Sowerby rode their luck but some good defending also kept Red Star at bay. George Oliver levelled for Red Star early in the second half. Conor McGow was outstanding for Sowerby but only two brilliant saves from keeper Hayden Bruce kept Star out and the home side’s Foysol Ahmed produced a moment of real class when his volley on the turn rattled the cross bar.